If game one of the NBA Finals is a preview for the rest of the series, we’re in for a wild ride. LeBron scored a playoff career-high 51 points…that’s 51 points and the Cavs still lost in overtime. 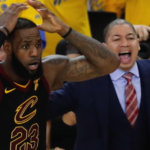 After a controversial charging call was overturned with 36.2 seconds left giving the Warriors’ Kevin Durant the opportunity to score on two free throws, and then the Cavs’ J.R. Smith dribbling away from the basket instead of shooting before time expired during regulation, the Cavs went into overtime looking dejected. The Warriors came out strong and finished the game 124-114. Game 2 on June 3rd, 8:00 pm ET. With 2.6 seconds remaining in overtime with the Warriors up by 10, the Warriors’ Shaun Livingston took a jump shot and Tristan Thompson felt it was unnecessary saying,”I contested a shot that shouldn’t have been taken. I mean, it’s like the unspoken rule in the NBA: If you’re up by 10 or 11 with about 20 seconds left, you don’t take that shot.” Thompson fouled Livingston, appeared to shove a ball in Draymond Green’s face and got ejected from the game. The refs will now review the play, and it’s possible Thompson could face a suspension in game 2. In addition, the Cavs’ Kevin Love (who was on the bench at the time) could get a suspension in game 2 as well because he left the bench during the mini-brawl.